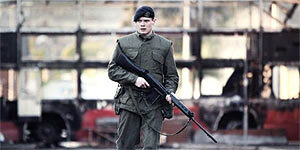 Stunning camera-work and editing take you right into the dark heart of 70s Belfast. Jack O'Connell doesn't have a huge amount to say - but his face speaks volumes as the ingénu thrust into a world of brutality and double-dealing. It's a truly gripping and physical performance and (like his character lost in an alien environment) you just really don't know what is going to happen next and who can be trusted. The wonderful Sean Harris is well-cast as a ruthless army under-cover agent who operates in the world of darkness as night descends. The creation of atmosphere in this movie is impeccable. The film pulls no punches about Britain's shady dealings in Ireland and the theme of lost innocence is powerfully hit home. Amazing that this is director Yann Demange's feature debut. Not to be missed.